(Charlestown, Nevis–Tuesday, March 8th, 2011) “One should never look back only look forward,” that advice came from Premier of Nevis, the Hon. 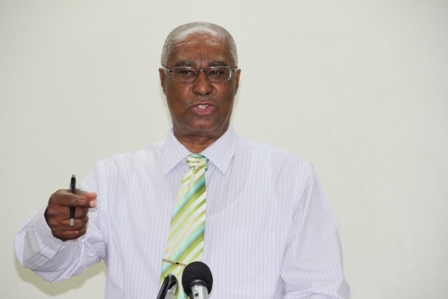 Joseph Parry as he delivered remarks at a ceremony which brought to an end the month of activities in the island’s celebration of Black History Month. The event was held on Thursday at the Cotton House building in Charlestown. The Premier said that although slavery was a major part of our Black history, black people everywhere need to move forward. “Slavery was a time in our lives… yes, but you can’t live with slavery being a major aspect all of your life, you have to move on. You see others have moved on, you must move on and I want to say that somehow, somewhere, whether in the United States, the Caribbean or right here in Nevis, we cannot keep on looking back. We need to know what has happened before slavery and after it and move on to the great potential which is within all of us,” stated the Hon. Joseph Parry. Premier Parry a former history teacher and University of the West Indies (UWI) graduate, told the audience that while he was at UWI, he observed how students were taught how to speak well, write well and how to criticize but very few students were taught how to do things, taught enterprise or taught to be creative. “Let us get rid of petty jealousies where we break down rather than build up. Why can’t black people see other black people in a more positive light?” the Premier questioned. In conclusion, he said he was happy with his color and said that he believed that a message must be taught to the children, he said there is a need to get rid of all the negative messages that are seen on television or heard on the radio, which demean the Black race.